Republican Asa Hutchinson waves to motorists as he campaigns in Little Rock, Arkansas. With the U.S. House likely to stay in Republican control, most electoral analysis has focused on the Senate. Yet there are 36 gubernatorial elections this year, from the Boston Harbor to the San Diego beaches, that have mostly escaped statistical analysis. No longer! 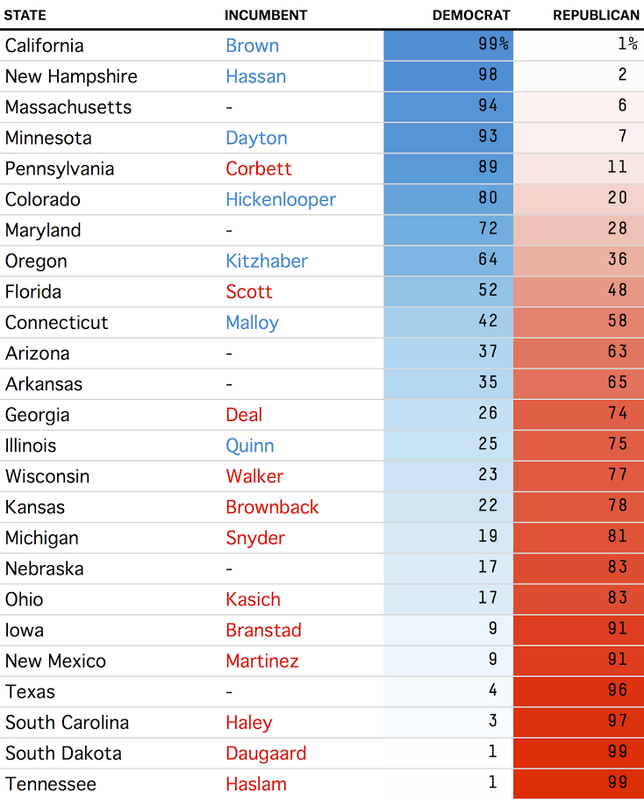 Early polling suggests Republicans are likely to maintain something close to their current 29-to-21 edge in governorships. Should we trust that polling? For the most part, yes. Early gubernatorial polling is, like early Senate polling, fairly predictive of who will win in the fall. I collected polling data for gubernatorial elections since 2006. It includes all races without a major third-party candidate and with at least one poll in the field from January through June of the election year. I used the same averaging technique as I did in my article on senatorial elections, which is similar to the average RealClearPolitics applies. 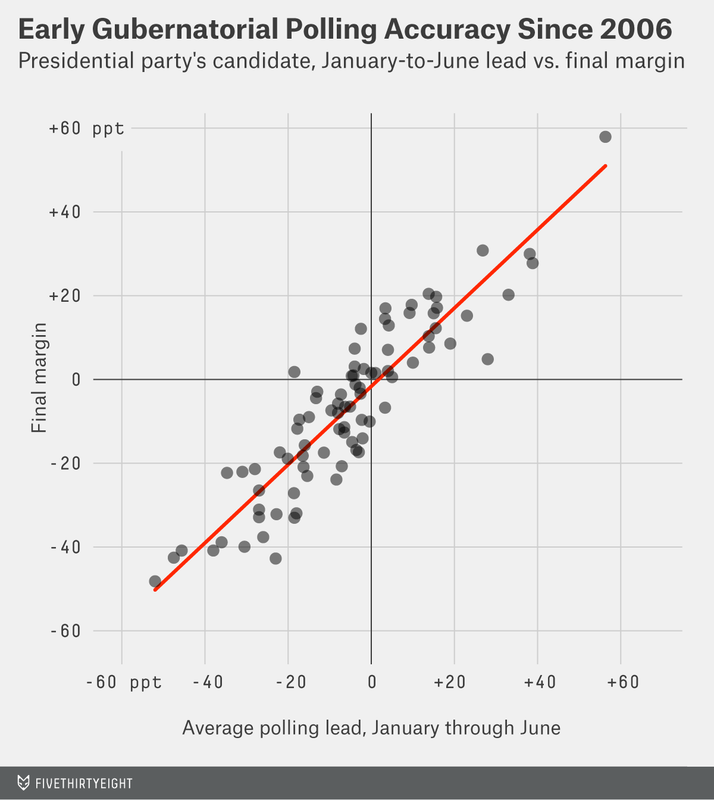 Another thing to notice about the graph, which plots the presidential party’s early poll margin against the final margin, is that the president’s party tends to do worse on average than early polling suggests. That makes sense given that the vast majority of gubernatorial elections take place in non-presidential years. As I have previously shown, polling tends to move against the president’s party as the midterm election year rolls on. This analysis isn’t definitive; it doesn’t weight the polls by past accuracy or include other variables, as the official FiveThirtyEight gubernatorial forecast does (that will launch in the summer). And because the races in Alaska, Maine and New York have strong third-party candidates — which makes the polling much less accurate — I’m not examining them here; we’ll get to those contests in a later piece. Neither party looks like it’s going to make major gains. Even if Democrats win a tight three-way contest in Maine, the numbers here suggest they won’t come close to picking up a net of five governorships, which they would need to hold a majority of governor’s mansions. Only in Pennsylvania do Democrats have a greater than 75 percent chance of taking a seat belonging to the Republicans. Democrat Tom Wolf has been crushing Gov. Tom Corbett in early polling. That’s not a surprise given that Corbett’s approval ratings in the latest Quinnipiac poll was just 36 percent. Only two other races have a greater than a 60 percent chance of flipping: Arkansas and Illinois. In Arkansas, Republican Asa Hutchinson has led Democrat Mike Ross in most polling, even as Democrat Mark Pryor has been holding on in the state’s Senate race. Gubernatorial races have been increasingly following the presidential vote, so a Republican winning the governor’s mansion in red Arkansas would follow that trend. Illinois’s Democratic governor, Pat Quinn, has trailed in nearly every single early poll against Republican businessman Bruce Rauner. This is one state where early polling may not be telling the whole story. Almost all the polls in Illinois have been conducted by automatic dialers that use a recorded message, which tend to overstate the GOP position (though the only live-interview poll we have also had Quinn down). Moreover, Quinn managed to win in 2010, despite trailing in most surveys during the campaign; it was probably the biggest general election polling blunder of the past six years. The two closest races of the year (without a third-party candidate) look to be in Connecticut and Florida. Connecticut, like much of New England, has elected its fair share of Republican governors, even though the state is reliably Democratic in presidential elections. Democratic incumbent Dan Malloy won by less than a point over Republican Tom Foley in 2010. A rematch between the two looks likely, and they are tied in early polling. Foley has the slightest edge given the tendency of races to move against the president’s party. In Florida, former Republican governor turned Democrat Charlie Crist is trying to defeat the unpopular incumbent, Republican Rick Scott. Scott has spent a whopping $10 million in early advertising, which has slowly but surely decreased Crist’s early lead. The polling average since the beginning of the year has Crist ahead, but if history holds and things move against Democrats, the race will be close. At this point, no other governorship looks like it will switch parties. Democrat Fred DuVal is an underdog with a puncher’s chance of winning the open race in Arizona, but it’s unclear who the Republican candidate will be. Democratic Gov. John Kitzhaber probably has a better than 72 percent chance of being re-elected in Oregon: He’s ahead of Republican Dennis Richardson, though early polling (most of it from Republican-aligned outfits) has been mixed. Other Republican incumbent governors may end up in trouble but are favorites. Sam Brownback in Kansas, Nathan Deal in Georgia, John Kasich in Ohio, Rick Snyder in Michigan and Scott Walker in Wisconsin all have between a 74 and 83 percent chance of winning. Deal and Walker are the most likely to be upset. Beyond these races, I would also note that we have limited data in Maryland and South Carolina. Whoever the Democratic candidate is in Maryland — probably Lt. Gov. Anthony Brown — is likely to have a better than 72 chance of winning over whoever the Republican candidate ends up being. But the only poll we have is a survey conducted for Republican Larry Hogan that has Brown up 7 points. In South Carolina, Republican Gov. Nikki Haley is a heavy favorite over Democrat Vincent Sheheen, though probably not a 97 percent favorite. We only have a Rasmussen Reports survey, which has Haley up 15 points. Overall, the early polling picture matches the conventional wisdom. A few governor’s mansions may switch sides, but not many. Republicans are favorites to hold most Republican seats, and Democrats are likely to hold most Democratic seats.